The dimensions are 650mm x 740mm x 375mm. The Umbria uses a large bioethanol burner with a fuel capacity of 2 litres. The fire burns 1 litre every 3 hours. The fire has a heat output of 2.5KW. 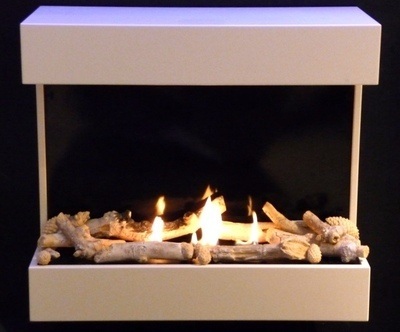 The Bio Flame Umbria is another of our best sellers and is a very distinctive fireplace. It is unlike any other fire available in the UK. The Umbria uses a unique burner with a patented ceramic core. The porous ceramic soaks up the bio ethanol like a sponge and then releases it in a controlled manner when burning. The bio burner is constructed from steel and is insulated to prevent the area getting too hot. This fire is TÜV approved and is, to our knowledge; the only bio ethanol fire in Europe with a TÜV safety approval stamp. The Umbria burns bioethanol fuel, which unlike gel fires does not need cleaning. The benefit of bio ethanol over gel fuel, gas and wood burning stoves; is that it allows you to sit around the fire without the usual inconvenience of smoke or strong odour. The fire is lit with an extendable lighter and extinguished using the sliding mechanism so you don't have to stick your hands in the flames. 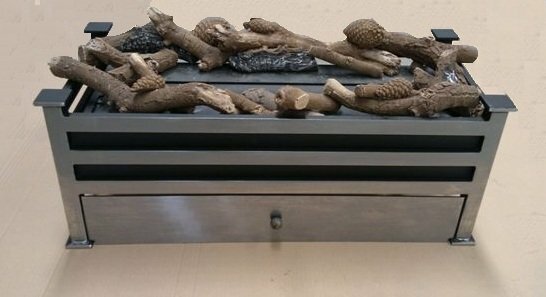 This fire pit can be dressed with ceramic logs, pebbles or our unique Black Diamond material.